It’s strange that singing, dancing orphans have become such a staple of musical theater, from Les Misérables’ pitiable Cosette to Miss Hannigan’s hard-knock guttersnipes in Annie. 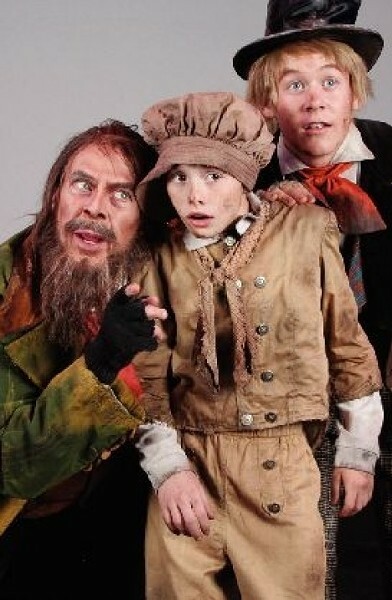 But there’s no musical urchin like Oliver Twist, the tuneful little foundling who started it all. Cayden Maynes is great in the title role of The Grand Theatre’s Oliver!, with a lovely, heartbreaking soprano and an innocent, unself-conscious pathos remarkable in such a young actor. As Fagin, the magical Max Robinson has a genuinely warm chemistry with his larcenous ragamuffins. The opportunity to work with Robinson is a great one for these young folks, and they seem to be enjoying it immensely—it’s like watching a favorite uncle entertaining the kids at a family reunion. Bill Sykes (Kit Anderton) is marvelously sadistic and menacing, with a hair-raisingly villainous baritone roar, while Adrien Swensen as Nancy is simply a knockout; her “As Long as He Needs Me” is a tour de force. Jared Porter’s set design makes good use of forced perspective to lend added depth and remarkable dimensionality to the Grand’s broad yet rather shallow stage. Jesse Portillo’s lighting effects are breathtaking and ingenious, though the climactic sequence could have used something a little more shocking and dramatic than just the nighttime blue gels. Overall, this production is faithful to the show’s original intent as pure entertainment, with no hint of modern angst or moralizing. It’s curious that we can just watch a toe-tapping show about desperate poverty and societal injustice without feeling like we have to draw conclusions about today’s world.